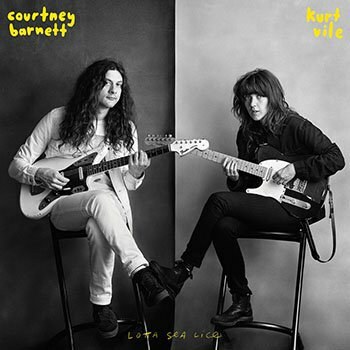 Indie rock collaborations can be ripe for disappointment, but Courtney Barnett and Kurt Vile wow by doubling down on the clever lyricism and exploratory guitars that make them each revered figures on their own. Label: Matador / Marathon Artists / Milk! When two marquee names in the rock world come together, the results are often, at best, a mixed bag. The promised pairing of Australia’s Courtney Barnett and Philadelphia’s Kurt Vile immediately raised expectations -- and created the fear of an inevitable letdown. Fear not: Barnett and Vile have drawled and noodled their way into a 2017 album standout with their debut duo effort, Lotta Sea Lice. Even for these two top-tier indie rock talents, it’s rare that lackadaisical sounds so professional. The ground was set for chill vibes long ago. While Vile’s former bandmate Adam Granduciel, of the War on Drugs, has built a remarkable reputation for perpetual studio tinkering, Vile’s solo records -- most notably 2013’s breakout Wakin on a Pretty Daze -- are known for sounding tossed-off. Similarly, Barnett’s output so far has been nothing if not carefree. “I guess if you’re afraid of aiming too high / then you’re not really gonna have too far to fall,” Barnett sang on fan favorite “Out of the Woodwork”, from 2013’s The Double EP: A Sea of Split Peas. It’s perfect, then, when Vile delivers that line and that sentiment here in his winking reworking, cleverly reframed as “Outta the Woodwork". Barnett returns the adoration later on the album with her cover of Vile’s “Peeping Tomboy”, here billed as “Peepin’ Tom". Barnett effectively softens the original, which appeared on Vile’s 2011 record Smoke Ring for My Halo -- an album Barnett praises as “one of the most beautiful and luscious albums I ever heard". She exudes love for the tune through her delicate, acoustic delivery. Lotta Sea Lice, while artfully allowing both artists to shower love for the other via winning covers, really excels through the new material. The six-minute-plus lead single “Over Everything” gives Vile and Barnett the space to trade playful verses over chugging guitars. “I want to dig into my guitar and the blues riff that hangs over everything,” they sing. They dig in deep -- together. It’s a hypnotic shared journey, particularly as it blasts into spacey realms toward the end. But they remain locked in always: as relaxed as this album is, it never devolves into a haphazard mess. It’s a skillful balance to pull off this feat; Barnett and Vile manage to maintain a blissful professionalism throughout the record. The other standout is “Continental Breakfast”, which showcases more of the finger-picking Vile style. It’s long and ambling, like a never-ending brunch. Lyrically, they manage to shrink the world, with great effect, by describing their creative partnership playing out “somewhere on the sphere around here". As a nine-song package, Lotta Sea Lice sonically is unmistakably a Kurt Vile production. His style -- from the serpentine guitar work to the languid vocal delivery -- permeates almost every nook and cranny of the album. Barnett certainly differs from Vile in terms of musical ambiance, even as she asserts herself as an equal partner in a weightier collaboration than one would expect. Lotta Sea Lice, with its knotty, sinewy guitars and killer harmonies, is a generous album. Barnett and Vile pack in plenty with zero filler. They’re both expansive and playful. The result is pure magic -- a brilliant concept that actually delivers, making it one of the more enjoyable rock records of 2017.